Did the editor even know this small editorial choice did this? Took away a philosophical reference? Did the editor consider that an author chooses his words with care? To any reader who cherishes Ray Bradbury, and his message, it was a slap in the face. I can see Socrates, Plato, and Bradbury shaking their heads in plain awe. Did the publishing company even care to double check the edits? For the sake of making the reading easier, did they think for a moment that maybe that specific word choice was to jog the reader’s mind and have them question it’s placement? It was a word. It was juxtaposed in the text to illuminate the point. It was an allusion to Plato’s Allegory of the Cave. The number of times that I have thought about this edit by the publishing company could be enumerated by the same number of times I have thought about the very allusion to which the original word references. To be “enlightened.” To walk toward the light. To adjust one’s vision. And more importantly, to consciously walk toward the light – knowing that life will never be the same once you have left the cave. To walk toward the light even if one experience’s pain and fear. To continue the walk toward the light. -How can we teach students about complexity when the texts are being made simpler? -How will future generations know the difference once all the old texts have gone away? -How can the truths of Bradbury (and even that of Plato) continue to help develop society when they are sublimely being eliminated or dulled? There are times when I have left a cave… seen the light. And realized in that moment how many people are left watching the shadows dance on the wall thinking they themselves have seen the light. I wonder if Aaron Swartz looked back and saw how many people were still in the cave believing in the shadows when it came to the laws of censorship. I wonder if he just felt overwhelmed. How great is this fight to retain a knowledgeable, articulate, free-thinking society… this democracy. The texts are changing right beneath us. That’s why we teach, right? 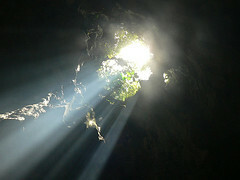 To help the individual decide if they want to leave the cave and see the light? At least give the reader the option… don’t take away that choice. A word, a look, a moment – no matter how small the instance… sometimes occurs for a definitive purpose. This entry was posted in Philosophy, Reflection on March 26, 2013 by coachk.